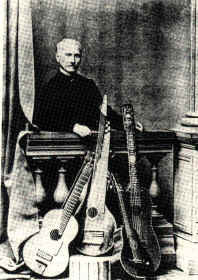 Napoléon Coste was a major figure in guitar composition of the mid-nineteenth century. He belonged to the generation after Sor (with whom he studied), and he created a new idiom for his instrument which is quite different from that of his predecessors and in many ways more advanced. He lived mostly in Paris. Coste was born in the Département of the Doubs, France, where the beauty spot known as La Source du Lyson is situated. Schubert songs with their piano accompaniments arranged for guitar by Coste. And also Beethoven’s “Adelaide” with its piano accompaniment arranged by Coste for guitar . Napoleon Coste Composer, a small book about Coste. Available from Tecla in English as Napoleon Coste Composer or in French as Napoléon Coste Compositeur. Napoléon Coste: La Source du Lyson, op. 47, for solo guitar. Read the complete preface to Coste’s La Source du Lyson. This is a major piece of research on Coste, giving many details about Coste, his background in the Doubs, the relation of this work to the Doubs, Coste and the painter Courbet, etc. It is recommended to anyone who is interested in this composer.